While the focus of outdoor seasonal decor may be outdoor Christmas decorations, Benchmark Landscape Management provides outdoor decorations for all four seasons. Fall and winter are prime seasons for outdoor decor. Seasonal decorations give you an attractive yard after your plants "vacation" for the winter. 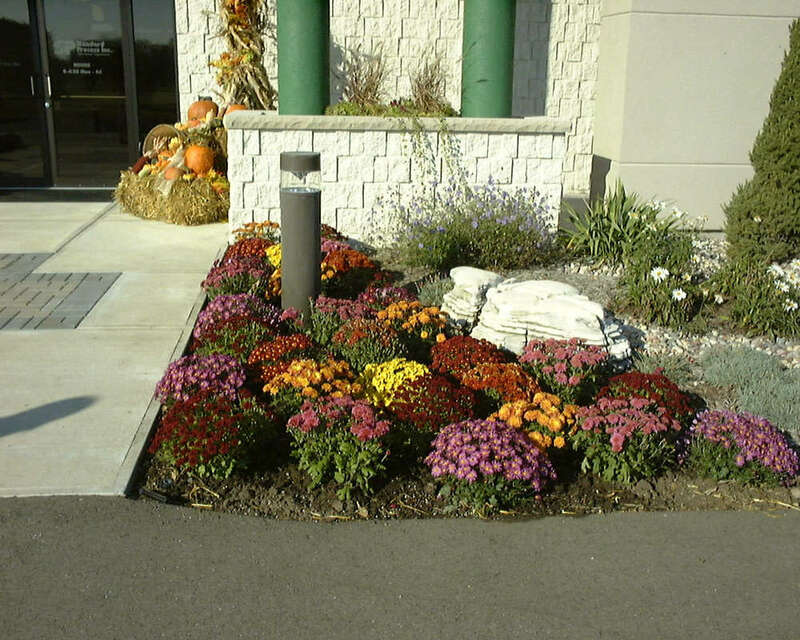 Benchmark Landscape Management provides outdoor decorations for all four seasons. We provide year round or seasonal lighting for trees, shrubs, and structures such as walls, homes, and buildings. We can light a tree using a cherry picker (aerial lift) to light large trees. (See examples of installation and results in the gallery above.) Besides lighting we install holiday wreaths and garlands. These can be enhanced with ribbons and other seasonal decorations. We can help you with anything from simple lighting and holiday wreaths to large scale Nativity Scenes. We help your property represent the values and message that you want to present to your public and neighbors. Commercial customers, consider adding seasonal interest to your signage. Adding seasonal decor to your outdoor signs not only makes them more attractive, it shows that you are engaged with the community and the season. Show your neighbors and customers that you are actively looking to make a positive statement about your business. In addition to outdoor Christmas decorations we also do fall decorations. Our fall decorations feature seasonal items like pumpkins, straw bails, corn shocks. We blend natural and man made items into a display you will be proud to show your neighbors and clients. We will plan, install and remove the items as you direct. In the summer we can install buntings with supporting materials and seasonal plantings. 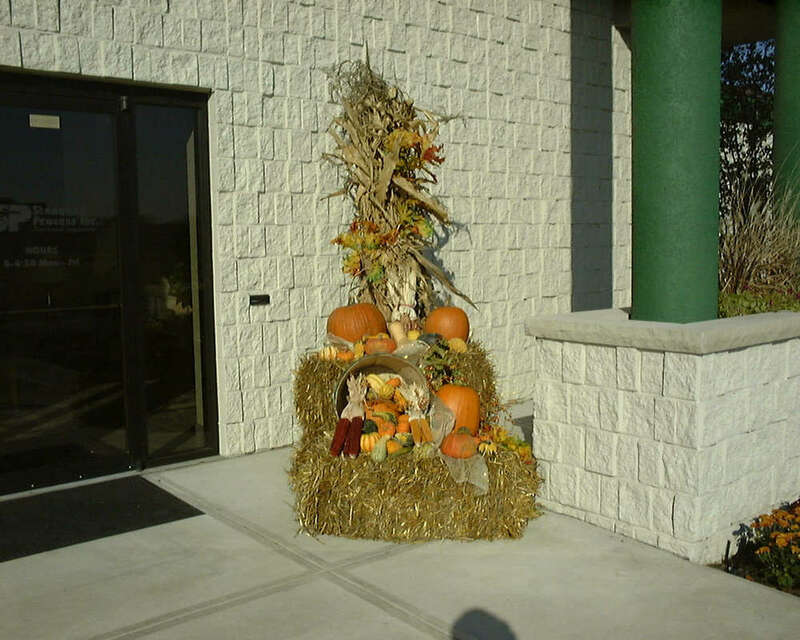 Fresh and inspiring seasonal decorations will enhance the appearance of your business or yard. 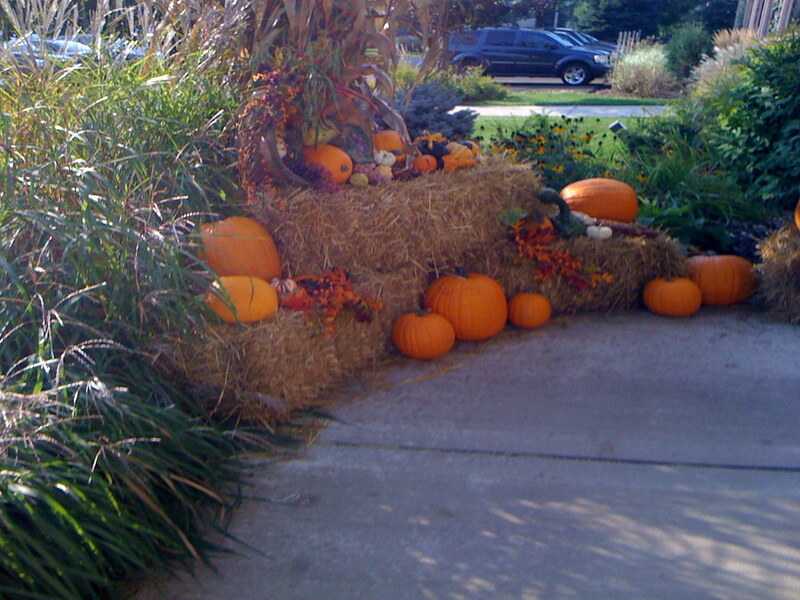 Fall Displays featuring pumpkins, corn shocks, straw bails, etc. Patriotic summer displays featuring buntings, flags, and other materials. Halloween displays using natural and man made materials. Temporary displays to promote your event or business, birthday, anniversary, etc. Note: We also do determinant outdoor signage and displays.